days, April 20 till sunk May 6 1945.
on 6 May 1945. Photo courtesy of http://uboat.net/men/commanders/332.html. was sunk of Newport Rhode Island. in New England may have lasted longer. depth charges once she had picked up the dozen men. on board under the command of Captain Charles E. Prior (UBoat.net). from Quonset Point took 15 of the survivors to Newport. commander, Lt.-Cdr. 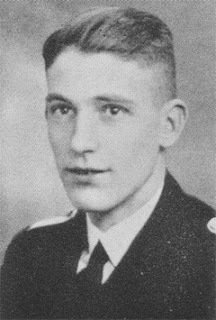 L. Iselin, detected the U-boat (Wynn). wooden navigator’s table and an officer’s cap – most likely that of Frömsdorf. 1944 (Busch & Roll) under Helmut Sommer.